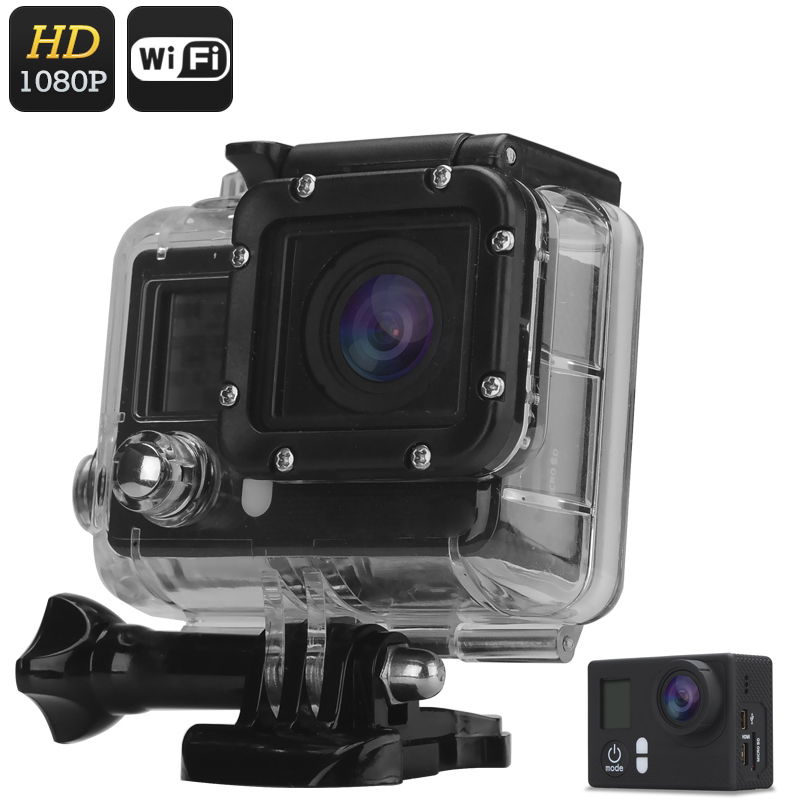 Successfully Added 12MP Sports Camera "Vision" - 30M Waterproof, 170 Degree Wide Angle Lens, 0.7 Inch LCD, Wi-Fi, FPV (Black) to your Shopping Cart. The "Vision" Sports Action Camera has a huge 12MP CMOS sensor and a 170 Degree Wide Angle Lens as well as Wi-Fi function, first-person view and it’s also waterproof up to 30 meters when house in its protective case. The main reason for having a camera like the "Vision" is to capture those impressive moments in your life when you’re living to the extreme. Whether bungee jumping, paragliding, scaling a precipice or a white water adventure, whatever it is that takes your fancy the "Vision" action camera can be right there with you. The 12 mega pixel CMOS will capture every moment of action packed fun at 1080p resolutions so it’s crystal clear when you share the video later and relive the fun. Coming with a tough waterproof case the "Vision" can take to the waves with you as it's protected for 30meters inside its secure water tight case. With a host of different attachments you can strap it to your surf board, helmet, handle bars or other sporting equipment. The 170 degree wide angle lens means it can capture a full view of the surroundings. Wi-Fi Support lets you send the pictures directly to your phone or tablet and with a downloadable app you can remotely view the video feed, start and stop recording and even use it to line up your compositions. There is a micro SD card slot that supports cards up to 32GB, which can store plenty of video footage and even makes it easy to transfer later. This "Vision" is a high quality GoPro Hero 4 Clone, but at a fraction of the price of the big brand models yet it still delivers the same quality recording. You can capture video at 30FPS or 60FPS as well as enjoy photo burst and time laps photography. The 1050mAh battery means you can use it for up to 2.5 hours from one charge and with all the accessories you could think of its ready and waiting for your next adventure. This product is in stock now, we guarantee next working day shipping and offer a 12 months warranty on all our products. Brought to you by the leader in electronic devices as well as wholesale sports cameras, Chinavasion. Weight, dimension is for the main item of this boxed product, to help you compare product sizes before buying: please do not base your shipping calculations on this price - shipping prices depend on your cart contents, shipping destination, and shipping method: please use the checkout to select options and preview shipping price for your total order. easy software,quality product & good price.